Kings Cross Theatre – an intimate performance space on one of the upper floors of the Kings Cross Hotel – was established to ‘help support and grow the arts community in Sydney’. bAKEHOUSE, who curate the space, have a particular interest in providing opportunities for new and emerging artists to create and showcase their work. Youth and Destination, their latest, falls perfectly within this remit: it’s the playwriting debut of James Raggatt, a young actor at the beginning of his professional career. Raggatt, who also directs, has woven together a series of very short and only vaguely connected vignettes that explore varying concepts (named in supertitles that hang above the playing space). There’s ‘uncertainty’, ‘paranoia’, ‘desire’ and ‘war,’ among plenty of others. These are snapshot moments gathered across a Sydney we might know from our own lives. Some of these fleeting impressions are recognisable enough that the entire audience cringe-laughs – like a missed connection on an Inner West train line – and some play with the idea of a catastrophic near-future, a near-game-changing twist that doesn’t quite land. The play follows a similar structure to Caryl Churchill’s groundbreaking Love and Information, which has 76 possible scenes and all lines unassigned by the playwright, divided between a cast size of the director’s choosing (it was performed with eight cast members at Sydney Theatre Company in 2015 to critical acclaim). It’s this conceit in Youth and Destination – the momentary engagement with an idea only to change direction a few minutes later – that’s both refreshing and a little unfulfilling. Just when we start to connect with a character and lean into a story, it’s gone, and the scene that follows may not sustain that level of engagement. 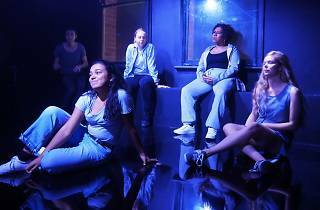 Raggatt’s play is necessarily fragmented and surface-skimming, but is yearning to make an emotional impact. These two ideas are often in opposition with each other, but there are moments when he lands on a scene that connects emotionally and establishes a tangible sense of place and feeling, A story about two men in a club, and an act of violence that follows, is evocative both in its language and its contained nature, and a couple of the seconds-long scenes that help transition us from heavier moments are effective, and appreciated, tension breakers. There’s a cast of ten in Youth and Destination: Jack Angwin, Georgia Blizzard, Gloria Bose, Julia Christensen, Maree Cole, Skyler Ellis, Alex Malone, Bardiya McKinnon, Nikita Waldron and Ross Walker. 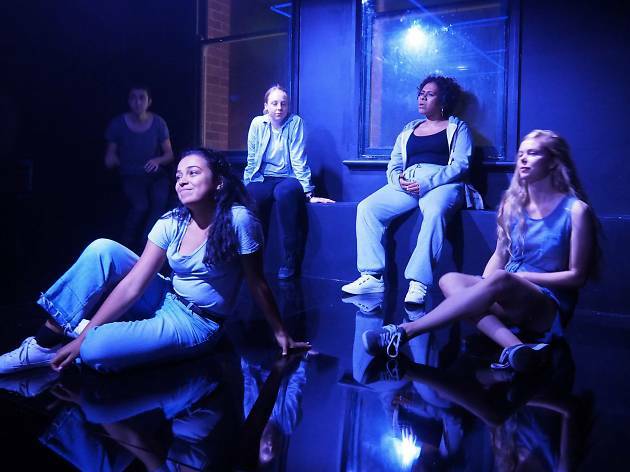 This group of emerging performers are lively and in close connection with each other; the act of moving around the small space to transition scenes happens with a familiar and warm awareness of other bodies in the space. You feel a sense of community from within their ranks. The exciting thing about going to Kings Cross Theatre is that you may well be seeing people and ideas at the beginning of their creative lives. You’re watching artists learn new performance languages, test themselves and their audiences, and offer their art in a sincere attempt to connect with an audience in the heart of Sydney. Every KXT work, in some way, pushes forward the Sydney arts scene, and Youth and Destination is no exception – it’s an opportunity for artists to experiment and create, and it’s a chance for the audience to see where our local performance culture is headed.